Saturday Skin Daily Dew Hydrating Essence Mist. Only good on Saturdays, right? WRONG! This face mist is absolutely perfect for On Wednesdays We Wear Pink ... and, okay, every single day. Now, in case you weren't aware, I have a MAJOR face mist obsession. Like, it's kind of epic proportions major. I've long been in love with the fact that a face mist instantly hydrates, nourishes and revives the skin with just a few quick spritzes. And, if that's not enough, they're always so pretty! I always have them on my vanity, my nightstand, my desk at work, rattling around in my purse ... basically, I keep them on hand (on face?) at all times so my skin never suffers from dehydration. First of all, I loooove the packaging. Come on, it's pink! It instantly makes me feel happy just by looking at it. 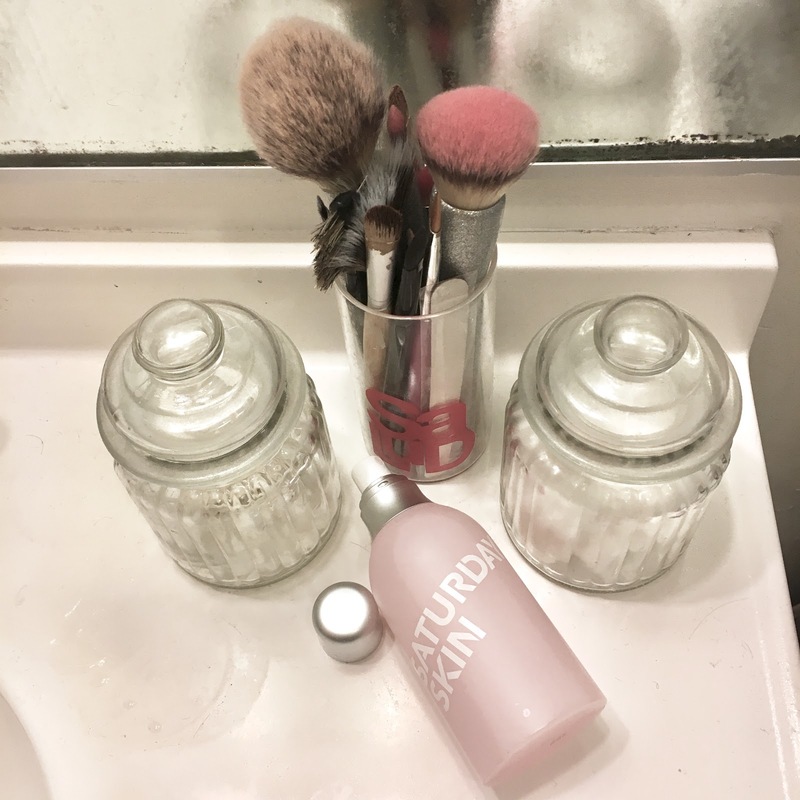 I never really thought I was the biggest fan of pink, but recently, I seem to find myself wearing more and more of it, and I've definitely introduced tons of pink products into my beauty routine -- hence this column, of course! But this face mist is fabulous for so much more than just the totally chic packaging. Once you uncap the bottle and spray this mist onto your skin, you're hit with a mix of kiwi and grape extracts that make your skin feel softer and smoother in a flash. It's also formulated with an exclusive Cha-7 ES Complex™, which supports the skin's natural regeneration process and helps with collagen and elasticity while reducing the appearance of melanin. (Can we say miracle worker?) The scent is light and airy, not too overwhelming. I like to spritz this on prior to smoothing in my serum and moisturizer to get an extra hit of hydration. I've also found that it helps my skin look less lackluster, especially after a night when I don't get enough sleep. And, if you're like me, that happens on the regular -- so this is definitely a good face mist to keep in your rotation! Fresh, fabulous AND pink? This face mist is absolutely made for more than just Saturdays! Saturday Skin Daily Dew Hydrating Essence Mist retails for $34 at sephora.com. I love face mists as well, and wow is that pink packaging super cute, or what! I don't use facial mists often but this one sounds very nice, plus that packaging is so cute! Love the pink packaging. I'm not so sure about the fragrance but if they had it in the store I'd sniff it out. I love the packaging - I wonder if it's safe for acne prone skin? I love face mists as well and once I finish what I have I'll be picking this one up to try! I haven't tried the mist, but I used their moisturizer and eye cream and both are phenomenal! I've never really been a huge fan of mists, this looks lovely though!